Summer is definitely upon us. The nights are warm and the days are hot. Daylight has been more and more abundant. In fact, we are only a week away from the longest day of the year, the summer solstice. Washing machine problems – The washing machine is used very frequently in the summer time. Kids make their clothes dirty all day and the laundry piles up. More use of the machine means more drain build up. Plumbers get lots of calls related to washing machine drains in the summer. 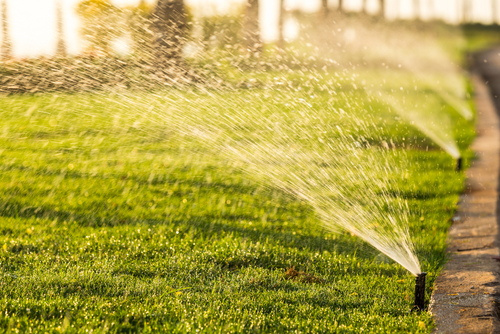 Sprinkler issues – The lawn is thirsty this time of year and water sprinklers are working over time. More use means more of a chance for them to break. One should check their system for leaks and make sure the heads are clean. Backed up shower drains – Heat plus more daylight equals more showers. The family must stay clean and that means more shower use. More soaps are washed down the drain as a result. Soapy residue and hair make for bad clogs. Make sure to keep pipes clear by occasionally applying liquid plumbing treatment. Clogged toilets – The incidents of clogged toilets goes up in the summer as well. The kids are home all day and, well, let’s just say stuff happens. When you have a severe blockage it is best to have a professional plumber address the problem. Insufficient Sump Pumps – We don’t have basements in this area but people who live in low laying areas have water infiltration around their house. They employ sump pumps to keep the water at bay. This time of year with all the rain, those pumps can become overwhelmed. Make sure you have the right pump for the space you are keeping clear. We post a new blog article every other week. Please feel free to bookmark this page or follow us on Facebook and/or Twitter.